In those dark days when Caesar Augustus was hailed as lord and savior, the One who really is Lord and Savior was born in tiny Bethlehem. In these dark days, it does seem that the likes of Caesar Augustus are still in control. Do we dare hail a different king? Now in those days the emperor Augustus was the most powerful king of the most powerful kingdom the world had yet seen: the Roman empire. Looking at the empire as a whole, it was a time of great stability. Things were more stable than they had been in many years. Some viewed it as a golden age of peace and called it the Pax Romana—the peace of Rome, or the Pax Augustana—the peace of Augustus. It was a good time to be alive—for the wealthy and powerful at any rate. 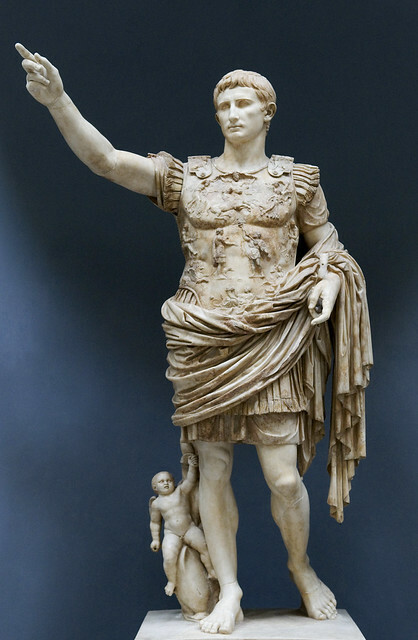 Around the empire Augustus was acclaimed as lord, divine son, bringer of peace, and savior of the world. Yes—those very words, including savior and lord. That’s what people were calling Caesar Augustus! But what they called peace was enforced by the threat of violence. Keep the subjects afraid. Any hint of unrest was quickly squashed by the mightiest army the world had yet seen. The Romans had an especially feared execution technique, called crucifixion, and they used it regularly. Not everybody stayed in line, but most did, most of the time. Maintaining the empire and the peace of Rome required lots and lots of revenue. That meant lots and lots of taxes—steep taxes, and the Romans didn’t want to miss any tax payers. Accurate tax rolls were a must.